Author and naturalist Ruth Kirk, who died Thursday at age 92, wrote numerous authoritative guides to the West’s natural wonders. Through more than 35 books, author Ruth Kirk shared the natural wonders of our landscape and encouraged people to discover and experience them. Ms. Kirk, 92, died Thursday (April 19) from Parkinson’s disease at Panorama Convalescent & Rehabilitation Center in Lacey, according to family. She became an authoritative writer of guide books about parks like Mount Rainier, the Olympic Peninsula, Crater Lake and Death Valley. She also was a filmmaker and photographer. A special collection at the University of Washington shows her projects from 1967-1991. “She was so inquisitive about the smallest details of life,” said friend Theresa Trebon. Her last book, “Ozette: Excavating a Makah Whaling Village,” written in 2015, focuses on the archaeological site and heritage of the Makah Tribe. Ms. Kirk was born in 1925 in Los Angeles and married Louis Kirk in 1943. She embraced the outdoors while her husband was a ranger and worked at national parks in South Dakota, North Dakota, California and Washington. The couple and their two sons, Bruce and Wayne, lived in the parks. “She would put the kids to bed and get in the bathtub and write late at night,” work that resulted in some of the first popular guide books about national parks, Trebon said. Her first book, published in 1956, was “Exploring Death Valley,“ which was illustrated with photographs by Ansel Adams. 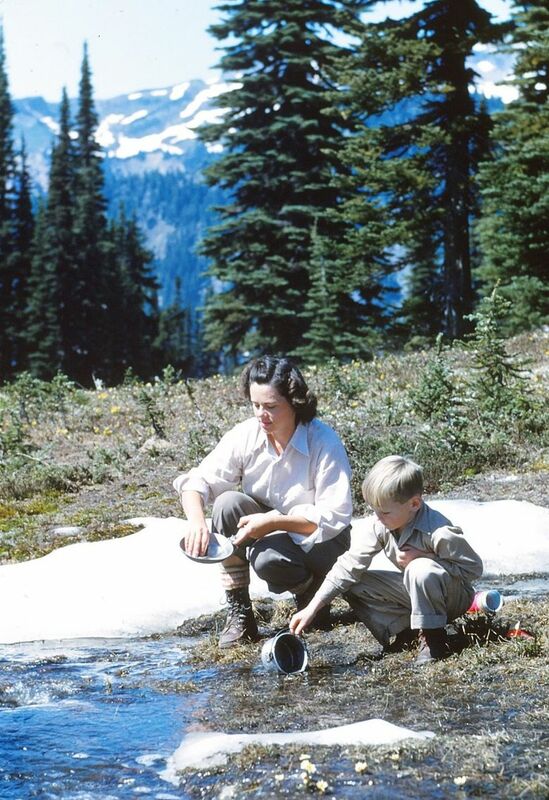 In the 1950s, the Kirks moved to Mount Rainier National Park, while her husband was a ranger. “Mount Rainier National Park was the love of her life,” Trebon said. Ms. Kirk climbed the 14,411-foot volcano several times and wrote “Sunrise to Paradise: The Story of Mount Rainier National Park” in 1999. Trebon said she was the “social den mother” to the other staff at the park. Ms. Kirk also helped build the Spruce Nature Trail on the Hoh River of Olympic National Park, said fellow writer John Dodge. “I was awe-struck by this beautiful and talented writer whose ability to crank out books on the natural wonders of the West was, and is, unparalleled,” he wrote. Her husband died in 1992 and she moved to Olympia. She married archaeologist Richard Daugherty in 2007 at the Makah Tribe reservation. She and Daugherty also wrote “Hunters of the Whale,” about a buried Makah Indian village and the excavation that recovered 55,000 artifacts, according to High Country News. She is survived by her son, Wayne. She earned the John Burroughs Medal for natural-history writing and a National Book Award nomination, states the University of Washington. She also received recognition for her writing from both the New York Academy of Sciences and the American Library Association.